Bengaluru FC head coach Ashley Westwood said his side are raring to go as the club take on their third season in the I-League, at a press conference held at the Bangalore Football Stadium, in Bengaluru, on Tuesday. Having made eight new signings in the summer, Westwood said that his side are stronger and more balanced than before. “We’ve managed to work fairly consistently over the last four weeks. We’ve got some new boys in and it’s always nice to have new faces to push the ones that are here who are getting a little comfortable. We’re stronger and we’ve got a nice balance about us with the new players who have the potential to go straight into the starting XI,” said Westwood. Asked about how this season is different from the last two, the gaffer mentioned about how competition for places has increased. “In year one we only used 13 or 14 players, last season we used 16 or 17. Now we’ve got 23 outfield players of which most of them have got a real chance of being in the first eleven which makes us a bit stronger and a bit more competitive,” the gaffer said. 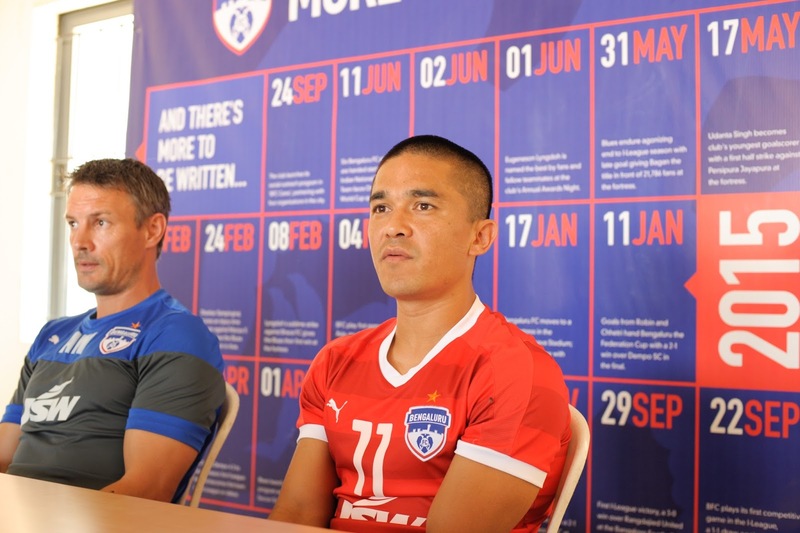 With eight new signings including the likes of Alwyn George, Kim Song Yong, Len Doungel, and Amrinder Singh, Westwood said his side were well conditioned, which will be the focus ahead of the upcoming I-League season. “It’s just a case of how you prepare and recover. The work we did before the Indian Super League has stood the players in good stead. We did a lot of conditioning before they went and not one Bengaluru FC player got injured in the ISL, which I don’t think many clubs can say. We prepared them well for the ISL and we’ll prepare them well for the I-League,” he added. Club captain Sunil Chhetri, who was also in attendance at the press conference, said the Blues side looked stronger than ever. “The side looks strong this year and so many new players have come in who can go straight into the starting XI. Robin Singh’s injury is a big blow to us, but it only means that somebody else has the chance to step up in his absence,” said Chhetri. With two new sides in Aizawl FC and DSK Shivajians joining the I-League fray this year and with the Blues’ AFC Cup campaign set to begin with an away trip to Laos, the gaffer said that the season would be tough. “Until we start the season on Saturday and have a good look of what’s coming, anything can happen. We see Royal Wahingdoh had a decent season last year, it could be Aizawl from the North East this time. One thing’s for sure, it’s going to be competitive and may the best team win,” he signed off. Bengaluru FC will take on Salgaocar FC at the Tilak Maidan, in Goa, on Saturday.